Fabrics are completely customizeable by you. Browse for fabrics from here. Leave me a note at checkout with your choices. Please choose 8 different fabrics. Crib quilt- measures approx. 36x48 inches. You will receive 48 blocks and 2 fabric markers. There is an option in the dropdown to add a message to your quilt. 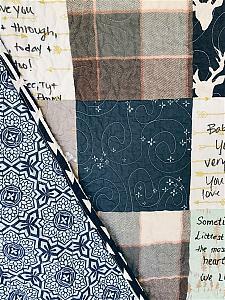 If you choose to add this to your quilt, leave a note at checkout with details of what you'd like it to say. You will be sent a proof before it is made. I will not create the message block until you approve. 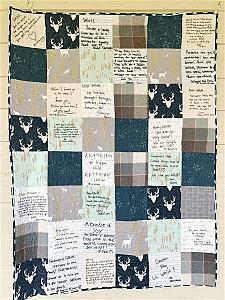 PLEASE NOTE that your message block will be the exact same size as all other blocks in your quilt. Please allow 2-3 weeks for me to get the fabric squares to you if you are located in the US. If you are in a hurry, I'm happy to choose fabrics for you that I have on hand. Just contact me first. - it is your responsibility to return all blocks once they've been signed by your guest. If there are blocks missing, then you will have to purchase additional blocks.